A pink shark with blue fins that swims up to 1000 m of depth? It is not imagination but reality, that describes a particular animal, known for the first time in 1898 and that takes the name of goblin shark (Mitsukurina owstoni). The name of the genus (Mitsukurina) derives from the Japanese zoologist K.Mitsukuri, that gave the first sample known to D.Jordan for description and identification. The name of the species (owstoni) instead comes from A.Owston, a collector that purchased the first sample from a Japanese fisherman. The whole body has a pink - grey clear coloration, diffused, due to the blood vases that are found under the skin that is thickness, almost transparent. Also the rigidity of the body is least, even soft and flabby and the skin has the tendency to ruin itselfand to easily tear. Also the conformation of the caudal fin, with the developed superior lobe and that inferior practically absent, together with the reduced dimension of the gills, suggest that this animal has the tendency to stir especially in proximity of the sea backdrops, with breves and lenses moves. The anterior teeth of the goblin shark are long, smooth and thin while those back teeth are stronger. This disposition suggests that its preys are constituted above all by soft small fishes, cefalopods and shellfishes, preys captured and held back by the anterior teeth and then shattered by back teeth. The goblin shark seems to be helped in the search and capture of the preys by its lengthened face, that can contain an elevated number of Ampullae Lorenzinii (Note 3), and from a system of extreme jaw protrusion. During the attack in fact the goblin shark pushes in before the jaw in very evident way, more than in the other kinds of shark, almost as a catapult, that makes to close the mouth in few fractions of seconds as a deadly trap. After having captured the prey the attack finishes and the jaw is withdrawn through of the ligaments of the jaw articulation. The mechanism of jaw protrusion is filmed for the first time in 2008: in the video, that is here proposed, a small goblin shark is stimulated to bite the forearm of a scuba diver to put in prominence the complete jaw movements. 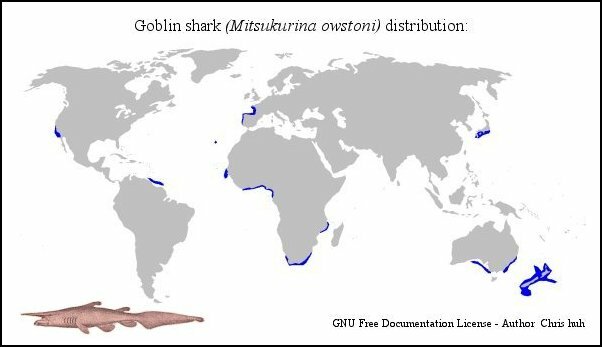 The goblin shark is present in some areas of the Atlantic ocean, in the waters that bathe South Africa, Portugal and France, in the Pacific ocean, from Japan to Australia up to the New Zelanda. The boglin shark is a abysmal creature, swimming in depth among 270-950 m, reaching 1300 m. Rarely has been sighted swimming in low depths. The maximum dimensions of this shark seem to be 400 cm, while middle dimension would be of 200-300 m. Goblin shark doesn't have commercial value, some sample is accidentally fished by nets. It is not dangerous towards the man. Note 3: in the abysmal depths, where the goblin shark swims, brightness is practically absent and in fact the small eyes make to understand that this sight of is not the winning weapon to find preys. Ampullae Lorenzinii are very important to find preys, present in the ample surface of the lengthened face. We remember that the Ampullae Lorenzinii are organs that take contact with the outside through small and numerous holes, present especially in the region of the head, full of a gelatinous conductor substance, in communication with nervous terminations. In this way the shark has the ability to perceive the electric fields produced by the animals (therefore to also individualize preys under the sand or in absence of light) and probably to recognize its own position in comparison to the Earth magnetic field. After having also individualized the prey with the help of the Ampullae Lorenzinii, the goblin shark tries to capture it with the fast movement of extension (protrusion) of the jaw, as already described. Note 2: the spiracle a small hole set behind the eye of these animals whose open/close is connected to the action of an unintentional muscle. Distribution: some areas of the Atlantic ocean, in the waters that bathe South Africa, Portugal and France, in the Pacific ocean, from Japan to Australia up to the New Zelanda. Coloration: The whole body has a pink - grey clear coloration, diffused, due to the blood vases that are found under the skin that is thickness, almost transparent. Commercial value: no commercial value.